Research undertaken by ForwardKeys, which analyses over 17 million flight booking transactions a day, reveals that the political unrest in the Central American state of Nicaragua has had a devasting effect on tourism to the country, with international arrivals plummeting by 61% in the period April – July 2018. According to a recent statement by the Inter-American Commission on Human Rights (IACHR) the number of people who have died during the unrest that has afflicted Nicaragua since April 18, stands at 322, 21 of whom were police officers and 23 of whom were children or teenagers. In addition, hundreds of people are currently under detention. The main source markets for visitors to Central America and the Caribbean are the USA, Canada and Spain. 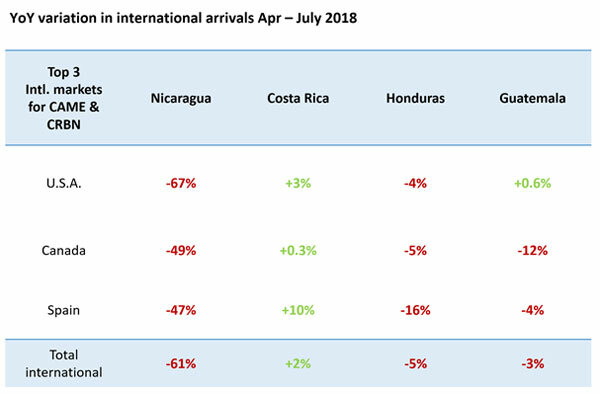 For Nicaragua, all are down very substantially, with arrivals from the USA down 67% from April through July; Canada is down 49% and Spain down 47%. Tourism to Honduras, which borders Nicaragua to the north-west and to Guatemala, which borders Honduras to the north-west both appear to have been affected by their proximity to the troubles, as arrivals in Honduras were down 5% and in Guatemala were down 3% over the same period. Costa Rica, which borders Nicaragua to the south, is fortunately not so badly affected; its visitor arrivals were up 2%, benchmarked against the equivalent period last year. Tourism is a vital industry in Nicaragua, as it is responsible for 15% of the country’s export revenue, according to the World Travel & Tourism Council (WTTC). Ahead of the troubles, WTTC had expected Nicaragua’s visitor exports to grow at 7.7% in 2018.